Please click here to sign a Change.org petition calling on the Silicon Valley Community Foundation (SVCF) to end its financial support for Islamist Relief. 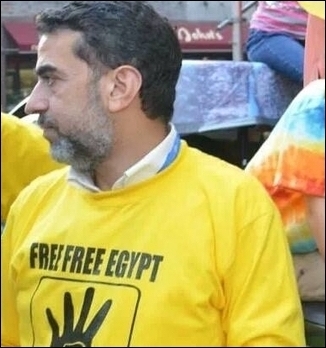 IR-USA Chairman Khaled Lamada displaying the Muslim Brotherhood's four-finger "R4BIA" sign. Islamist Watch has uncovered further evidence of anti-Semitism promoted by senior officials of Islamic Relief, the largest Islamic charity in America. Although Islamic Relief is a designated terrorist organization in the United Arab Emirates, it enjoys the support of governments and other charities all around the world, including $370,000 from the U.S. government in 2016, along with millions of dollars from the UN, European Union, Germany, Sweden and the United Kingdom. As Islamist Watch has previously discussed, these public monies serve to subsidize Islamic Relief's funding of Hamas-linked organizations in the Gaza Strip. All across the globe, in fact, Islamic Relief branches are led by Islamists with close ties to the Muslim Brotherhood and other Islamist causes. 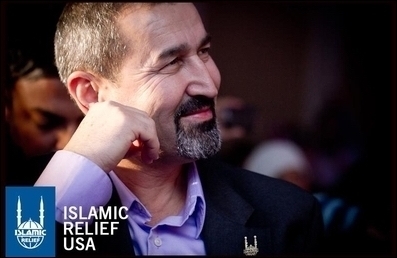 Islamic Relief's U.S. branch (IR-USA) is no exception. The current chairman of IR-USA is Khaled Lamada, a prominent Egyptian-American, who has a long history of involvement with Muslim Brotherhood organizations. He does not, in fact, shy away from publicly expressing his support for Islamist causes. His social media accounts are filled with Muslim Brotherhood insignia, including the notorious R4BIA sign – exhibited by Muslim Brotherhood supporters since 2013. Islamic Relief received $370,000 from the U.S. government in 2016. Worst of all, Lamada appears to hate Jews and admire violence against Israel. Writing and sharing posts mostly in Arabic, Lamada has circulated text praising the "jihad" of the "Mujahidin of Egypt" for "causing the Jews many defeats." He has republished claims on Facebook that praise Hamas for inflicting a "huge defeat" against the "Zionist entity." Further, Lamada has circulated videos that claim the current leader of Egypt, President Sisi, is secretly Jewish, and that he opposes the Muslim Brotherhood on the orders of the Jews. The video further claims that Jews are sowing division among Egyptian Muslims by encouraging sexual activities. Lamada's only comment about these anti-Semitic conspiracies is: "I hope this is not true." Lamada has even disseminated claims that America is controlled by a Zionist lobby, which is working to demonize Muslims and plan an invasion of Sudan and the Nile Valley. Lamada is not the only anti-Semitic conspiracy theorist running America's largest Islamic charity. Yousef Abdallah, east coast operations manager for Islamic Relief. 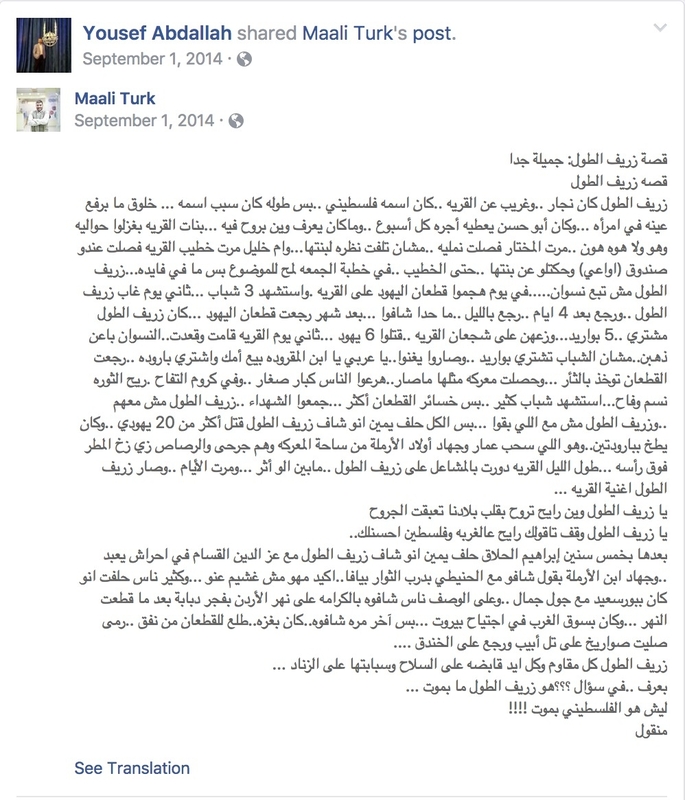 Last month, Islamist Watch uncovered anti-Semitic social media posts by another senior official of IR-USA, Yousef Abdallah, who published a story romanticising "martyrs" who provided guns to "kill more than 20 jews" and "fire rockets at Tel Aviv." Abdallah's other posts included references to Jews as "stinking," and claims that "the Jews put the outside wall of Al Aqsa [the mosque in Jerusalem] on fire." Abdallah also 'likes' a comment on his Facebook post that calls on God to wreak "revenge on the damned rapists Zionists. O God they are no challenge for you. Shake the Earth beneath their feet and destroy them as you destroyed the peoples of ʿĀd, Thamud and Lot." Another (former) IR-USA staff member, Omar Shahin, preached in 2002: "You will keep on fighting with the Jews until the fight reaches the east of Jordan river then the stones and trees will say: oh Muslim, oh (servant) slaves of Allah, there is a Jew behind me; come and kill him." That IR-USA's chairman and his staff appear to hate Jews is not particularly surprising. That this extremist, terrorism-linked, Jew-hating charity has enjoyed millions of taxpayers' dollars and dinners at the White House, however, is utterly perplexing.